I met last week with Denis Leluc, director of Perpignan airport, and Dimitri Sindres, Development Manager for Perpignan and Carcassonne. They would be very interested to know what your expectations are for these local airports, so that they can improve service, routes, facilities etc. Any comments to pass on? Any opinion goes, no matter how small, as the more we stress that there are many, many people involved, the more likely the airport is to take some aspects of our views into consideration. A big thank you to all of those who have already commented, either on the forum or on the FB page. The airport management ARE reading, listening – and following the thread with interest. They are open to all suggestions and constructive criticism. This is not a one-off discussion which will just fade away after Christmas – they have already started implementing improvements. Despite the fact that some people felt it not appropriate to say ‘I want a flight to Leeds’ (that’s me!) 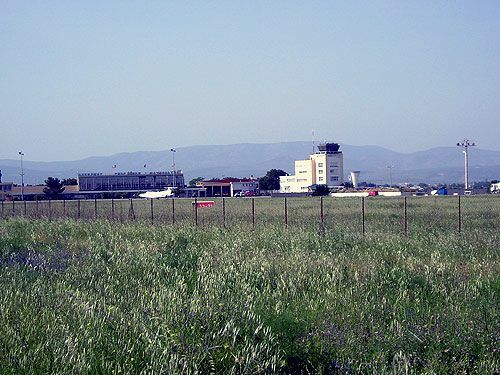 they are genuinely interested in seeing which destinations appear to be the most popular, so please register on the forum and post your request on preferred airport destination, and your opinion on changes needed at the airport of Perpignan. Below is a brief resumé of our conversation, tho I didn’t take any notes, so it’s quite general. More detailed info will be supplied in the New Year. ☛ Work has already started on the new look airport, which will have terrace for watching planes (and smokers), exec lounge, better all round eating, drinking and loo facilities, improved departure lounge…. ☛ Part of the new airport will be in the first building on your right as you drive up to the airport. According to the plans and photos I have seen, it looks smart and chic. ☛ They have looked at transport to and fro, and from March/April 2015, there should be airport transport. They are looking at a taxi share booking system where people can sign up to share a taxi to Perpignan, mountain or coastal destinations. There is already a bus once a week from the airport to the ski slopes in season. ☛ Staff have been pulled up about the bad attitude which they agree was present. They are much more pleasant and friendly now and hopefully that problem is on the way to being solved. They continue to monitor. ☛ A questionnaire will be prepared and posted online to continue to monitor your opinions, but this will be just one aspect of several forms of information gathering. ☛ Finally, a big thank you to airport director Denis Leluc, and development manager Dimitri Sindres, who were totally charming and have instigated a new idea at Perpignan airport – listening to the needs of their clients! PLEASE PASS ON THE LINK TO THIS THREAD. THE GREATER THE NUMBER OF COMMENTS, THE BETTER THE CASE TO PUT FORWARD.